The iconic chair – a favourite of the 1960s and 70s – has become a staple of stylish homes. By definition, it’s that elusive piece which endures decades of changing fashions, remaining as fresh and stylish as it was at its conception. The plan for the Spectre chair was to recapture its confident simplicity with a modern twist. Designer Sam Aylott tells of the inspirations behind the game-changer and discusses its unique handcrafted production. Q: What influenced the style of the Spectre? Despite an initial brief of creating an elegant modern armchair and the Spectre’s obviously contemporary style, this design is not without style precedent. In many ways, what we wanted to achieve harked back to the objectives of iconic Modern furniture designers and their chair designs which became classics of the twentieth century. The barely-there metallic framework, precise lines and pared-back sensibility all have roots in this era with an updated twist and it’s this that gives it its richness. It’s a modern piece, yes, but it’s a timeless modern piece – one which will endure well faddish trends and styles much like Mies van der Rohe’s Barcelona chair or Breuer’s Wassily chair. Q: What challenges did you face in designing this piece? As a metal framework chair, the Spectre posed the challenge of creating harmony between a beautiful form within an engineered framework. Despite the stigma attached to such a statement piece, this was always going to be a comfortable chair so alongside being robust, we also wanted the design to be approachable – a place to relax. Comfort was, of course, an important aspect of the production. There was extra attention to cushion thickness and foam density as well as the use of a Dacron wrap to tackle this. This obviously had to be done without compromising the proportions of the piece. The beautiful antiqued brass finish was also developed to further soften the steel construction. 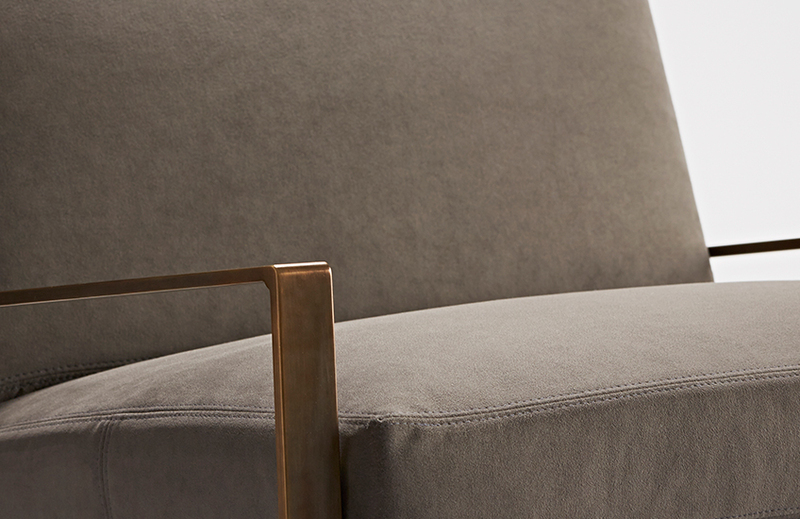 Upholstered with the gorgeous ultra-suede, it’s tactile, sleek, and extremely robust. Q: The chair has so many individual steps of production. Can you describe its process? Quantifying the time spent on the designing and production of the Spectre is difficult. As with all good design, a new piece becomes part of the designer’s life, constantly thought about until produced. In terms of workshop and studio hours I would estimate around the one hundred mark. Many hours were spent sketching and computer modelling, exploring the possibilities and making it just perfect. The actual production of the Spectre, however, can be split up into three main stages – metalwork, finishing and upholstery. 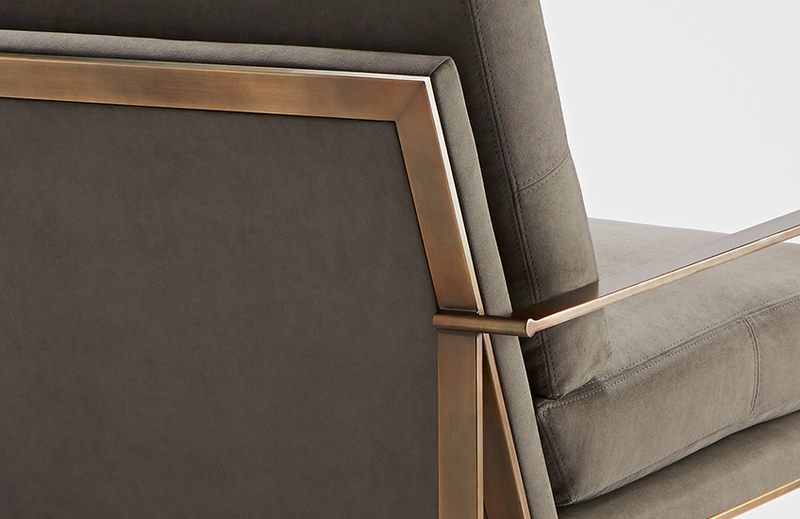 The meticulous production of the metalwork was followed to the millimetre, even down to radius of the frame’s edges to best compliment the design. The round bar detail – which was used to soften the angular form – doubled the hours required to fabricate but, as any design eye can see, they make the frame so much more special. Several steps are taken to obtain the flawless brushed brass finish. The steel-welded frame first has to be polished to a mirror finish since any blemish will be seen at the end result. Then the brass plating process begins. For this stage, the chair is placed into an acid bath and electrodes are positioned for the brass to adhere to. Once complete, the antiquing is hand-applied before being sealed with multiple coats of lacquer to protect the special finish. An extra special chair required extra special attention to detail at the time of upholstering. I worked with the upholsterer to develop the design to have no visible fixings so the frame cradles the upholstery organically. 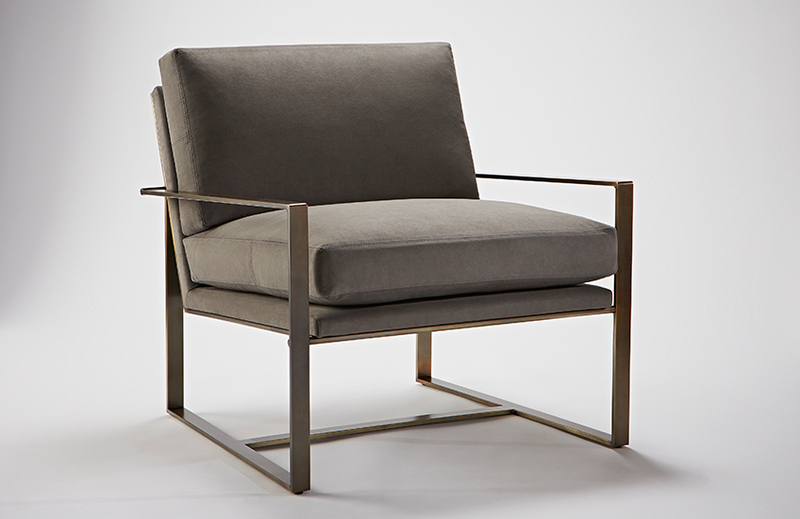 The simple but refined double stitch detail was selected to as a nod to the chair’s subtle sense of quality and luxury. The most rewarding aspect of the design process was to develop a piece which blended all three crafts to complement each other which was such a privilege. Doing so required a lot of skill on all parts but the final product speaks for itself. The quality of the craftsmanship is without fault. Q: What’s the most impressive thing about its production? I’m proud to say that the Spectre chair is entirely handcrafted in Britain – in this day and age, that bygone tradition is worth a lot. 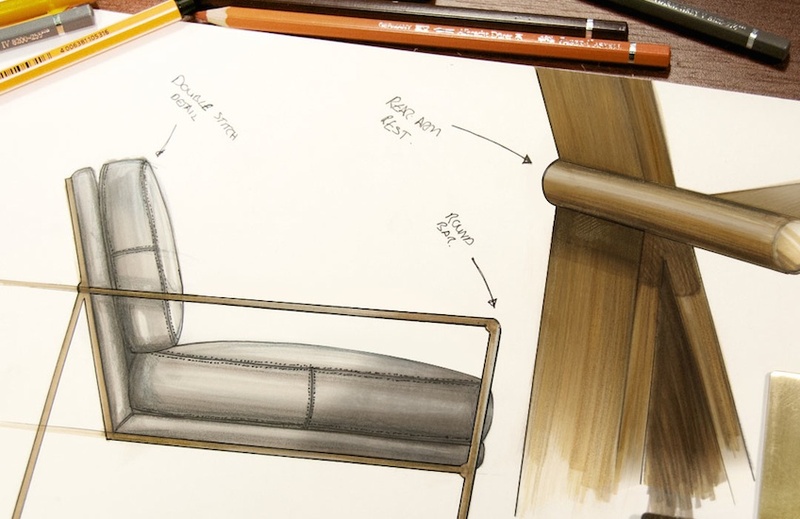 Care and consideration has gone into each stage of the chair’s production from the primary sketches all the way through to the stitching technique adopted for the suede upholstery. In my opinion, the frame design and production is the most impressive aspect of the piece as there are so many angles, fundamental to its ergonomics. Q: How would you describe the style of the finished result in three words? Tactile, meticulous, elegant – it’s the perfect blend.